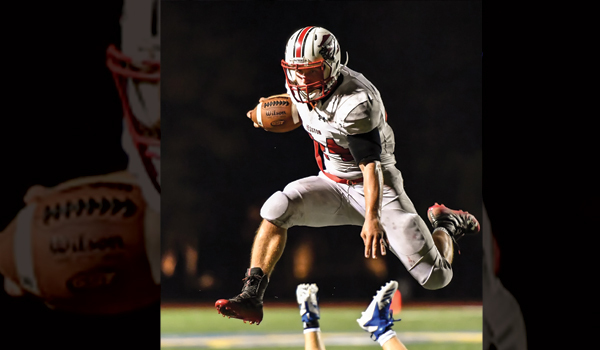 Kpreps.com would like to congratulate Kelly Ross for submitting the winning photograph for Week 9 of the Kpreps Friday Night Photo Contest. Kelly’s photo features Hesston running back Parker Roth leaping a pair of Wichita Collegiate defenders during the Swathers’ 42-28 win in the opening round of the Class 3A bracket. Roth rushed for 66 yards and touchdown in the game before leaving with a knee injury. He did not play in the Swathers’ 22-14 loss to Smoky Valley the following week. Roth rushed for 1,190 yards in just eight games this season and wrapped up his career with 4,832 rushing yards and 61 touchdowns. With this winning photo, Kelly is eligible for our 2018 Grand Prize including $500 in cash. Each week during the regular season and playoffs, Kpreps will select one winning photograph that will become eligible to win the grand prize. Only weekly winning photographs will be eligible for the grand prize! Weekly winners will be featured on Kpreps.com. Photographers across the state are encouraged to submit their photos on our Friday Night Photos page or email their weekly photos to photos@kpreps.com. Photos should be submitted by Wednesday of the following week. The winning photo will be announced each Sunday throughout the regular season. Please reference the complete contest rules before entering. Note: The photos submitted to this contest are the property of Kpreps.com and the individual photographers. Photos cannot be printed or used on any website or social media without permission. If you are interested in purchasing any of these photos, please contact us and we will put you in touch with the photographer.